Is professional services marketing an art or a science? When I started my career in professional services, most people in the business believed that it was an art. A firm’s success hung on its reputation and its ability to work a network and generate referrals. Apart from direct mail testing, there wasn’t much science to the proceedings. But today, that’s all changed. Marketing is being rocked by seismic shifts in behavioral science and marketing technology. In fact, we here at Hinge have come to the conclusion that professional services marketing has undergone a fundamental transformation. The discipline has become much more of a science, and it’s destined to continue in that direction, driven less by beliefs and subjective judgments and more by empirical observations of human behavior. But what precisely has changed? Why has the landscape of professional services marketing shifted so dramatically, and where do we stand now? Let’s consider how both the science and the marketplace have evolved. This research has been driven by a wide variety of new tools and research techniques, from the mapping of the human genome to fMRI scans to remote observational research techniques. As a result, we know more than ever about how people come to trust others, make decisions, and respond to stimuli. Duke University professor and author Dan Ariely, for example, has written extensively about his behavioral research on the roots of irrational decision-making. His conclusions have massive implications for numerous fields of human endeavor — including professional services marketing. Ariely has demonstrated that the choices people make — including buying decisions — are not nearly as straightforward as they might seem. A wide variety of factors (such as available alternatives) influence our perception of value. Things have uncertain value until they can be put in the context of other potential choices. William Poundstone, in his book Priceless: The Myth of Fair Value (and How to Take Advantage of It), explores the science of pricing in detail. He demonstrates that the price people are willing to pay for a product or service is largely determined by its context — price “anchors” around the product or service provide a critical point of comparison. These insights have profound relevance to professional services sales, which are often sold for tens or hundreds of thousands of dollars. To add further complexity to this issue, research by Hinge has shown that firms tend to overestimate the impact of price on a professional services buyer’s decision. Other factors, such as having a good reputation, routinely trump price. But it’s not just advances in behavioral science that have changed the marketing game. Advances in technology don’t just offer new opportunities to share your message — for instance, on your website or social media. They make it possible to analyze and improve your marketing efforts. Using marketing automation and analytics software, firms can now assess their own marketing efforts, automate complex marketing functions, and test different approaches at a level that’s never been possible before. The rise of analytics and marketing automation in the last couple of decades has revolutionized the way firms get new business: for the first time, entire marketing strategies can be measured, analyzed, and refined. In the past, it wasn’t possible to identify prospect behavior or monitor a firm’s popularity as you can today on social media. To be sure, we’ve entered a brave new world. The advances we’ve discussed are monumental, but there have been additional leaps that have specific implications for professional services. As our understanding of psychology and technology progresses, we’re not only accumulating tremendous amounts of data into consumer behavior in general, but we’re learning specifically how professional services marketing and branding influence buyers’ behavior. When do buyers look for a firm? How do they find one? 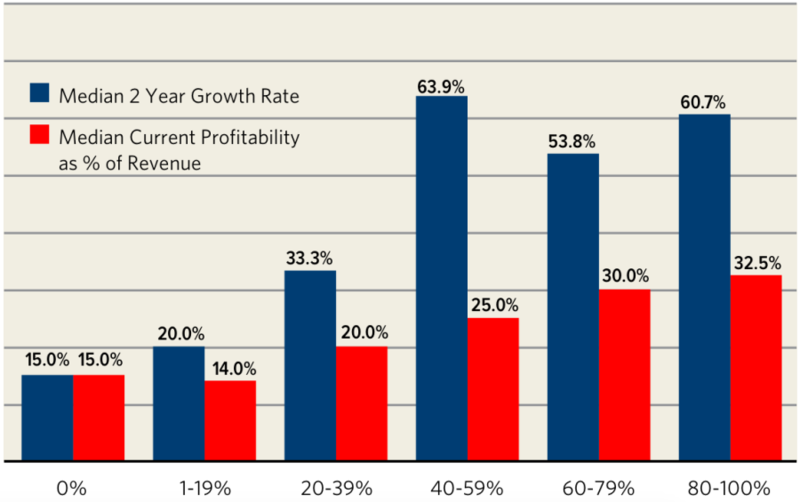 How do these buyers evaluate and choose among firms? Today, we can track very specific buying behavior related to these issues. For instance, we can see which types of content individuals download most, and which pieces of content are most often associated with people who later become clients. We can use these correlations to form hypotheses that we can test and refine to improve conversion rates, turn more prospects into clients, and increase revenues. We also better understand the role of expertise in professional services marketing. For example, an expert’s ability to translate a complex subject into easy-to-understand language is perhaps the single most important skill required to build reputation — in fact, it’s second only to word-of-mouth referrals. Today, we work at the crossroads of human behavior and technology, and groundbreaking new research is illuminating our understanding of the professional services marketing world. All of this technology and data allows us to understand what motivates potential clients. And that means we’re better equipped to target buyers with the right messages at the right time – at a lower cost than ever. Online marketing techniques, in particular, are often easy to measure and test. And when firms combine smart online tools with smart targeting (such as list segmentation), it’s possible to dramatically reduce the cost of reaching your audience and thrive. Look around you. We’re working in a new frontier of professional services marketing: one that promises faster growth and higher profits as scientists and marketers learn more about buyer behavior and what the highest performing firms do differently. Every day, researchers are uncovering new insights into human behavior and the professional services marketplace. So businesses that mine this trove of information and take a scientific approach to marketing will have a tremendous advantage in the coming years. If you aren’t looking at this data already and applying it to your own marketing, now is the time to start. Or risk being left behind. What’s your take? Do you view marketing as an art or a science? Let us know in the comments section below. And to learn more about effective professional services marketing in today’s marketplace, download a free copy of the full eBook, Online Marketing for Professional Services.